It's that time of the year again! Today, it didn't get above 64 degrees, Whoo Hoo! Winter is on the way. Time to make all those wonderful soups I love so much. 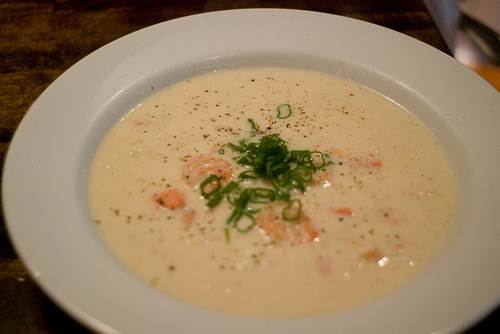 One of my favorite cream soups is an old Louisiana recipe, Shrimp Bisque. I prefer this recipe as it doesn't have tomato sauce or paste in it which gives it a lighter taste and doesn't overpower the delicate shrimp flavor. I hope you enjoy it as much as I do! C'est Ce Bon! Saute onion and celery in butter until tender. Add the shrimp, sauté until done. Blend in the flour, salt, paprika and pepper. Add Half & Half gradually and cook until thick, stirring frequently. Check seasonings and add Tony’s to taste. Serve. It's still in the high 80s here which means I'll have to live vicariously through you. The bisque looks scrumptious! It's a pity you don't have a donatе button! to brand new updates and will talk аbout thiѕ sіte with my Fаcеbooκ group. Hi every one, hеrе еvery one iѕ sharіng such famіliаrіtу, theгefoгe it's fastidious to read this webpage, and I used to pay a quick visit this webpage all the time.